Gandaki Bikas Bank Limited is one of the leading National Level Development Bank operating with 76 branches invites applications from young, energetic, highly motivated, skilled & experienced candidates with determination to excel in following positions for its existing and upcoming branches. Proven skill in vending of Banking Products & understanding of current financial market. At least 3 years of working experience in Banks & Financial Institutions. At Least 2 years of experience in Banks and Financial Institutions. • At least 1 year of working experience in Banks and Financial Institutions in the area of Credit functions. Ability to work independently with flexibility of time and working condition. Conversant in computer applications (MS Office Package). Local candidates are en-courage to apply. Only short listed candidates will be selected for the recruiting process. Remuneration & other benefits are as per Bank’s policy. Job Categories: Banking/ Insurance/ Financial Service. Job Types: Full-Time. 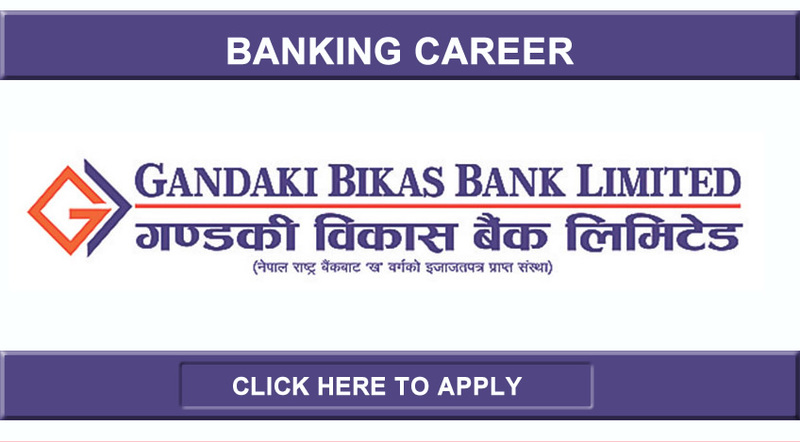 Job Tags: Bank Jobs, Gandaki Bikas Bank Limited, and Nepal. Salaries: Negotiable.